Music duo Thompson Square and Jake Rose perform at UW-Platteville during their ‘This is Us’ acoustic tour. Thompson Squared told the audience that the UW-Platteville crowd was the biggest one they performed for so far on their tour. 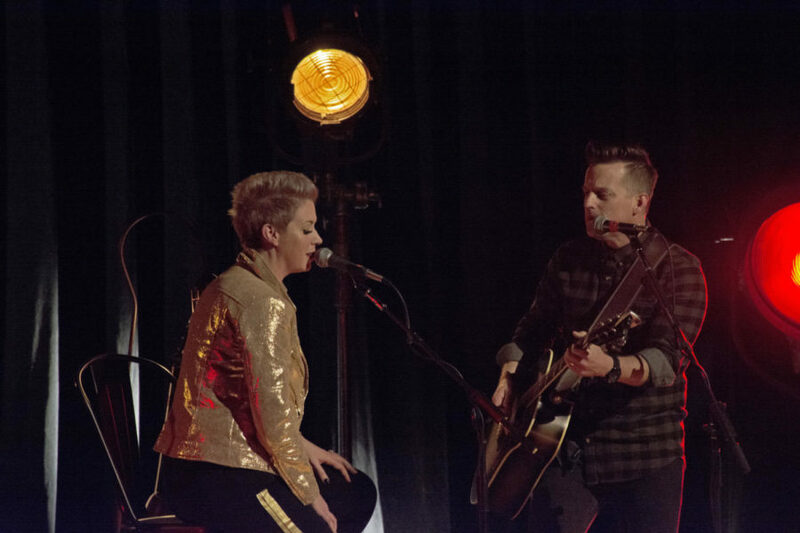 The country duo, Thompson Square, put on a performance last week in the Richard and Helen Brodbeck Concert Hall. The entire concert was acoustic, and the concert opened with the new rising country star Jake Rose. Rose played for about an hour, and during this time, he shared stories and new songs with the audience. He is a young star, and he is continuing to rise in the music industry. Rose just released his first single, “Sleeves.” This song tells the story of all the tattoos Rose has. Each one has its own story, and each story is important to his life. “This ink is more than skin deep. That’s why it’s there, why I wear my heart on my sleeve,” Rose sang as he introduced his new single. Rose was joking around with the audience between songs, and he made the concert personable and special. At the end of Rose’s set, he jumped down into the audience to sell his new CD and take pictures with the audience members. This action is not seen at regular concerts, so it was yet another thing that made this acoustic concert unique. After about an hour, Rose finished his set and Thompson Square came on stage. They had an elaborate stage set up of gold-colored lights of all sizes, stools and tables and a small round platform atop of the wooden stage. It allowed them to sit while they performed, making the concert more informal. “We want to make this show original for y’all,” Shawna Thompson said. When asked what inspired the husband-wife duo to write their songs, the answer was simple. “Our little boy, Cooper, who is almost two years old. We base it off of what we’ve been going through – both the good and the bad,” Shawna said. Throughout the concert, Kiefer was making jokes and telling stories about how he met Shawna, all the while making the audience burst out in laughter. This was something that was unique to the acoustic concert, and that is why it became so personal with the audience members. As the night went on, more songs were played and laughs were shared. They played old songs, they played new songs, they told us about the new record deal they signed on to, meaning they will be putting out new music come January 2018. The new album to look for would be titled Masterpiece based off of the life they have lived and everything they have gone through.